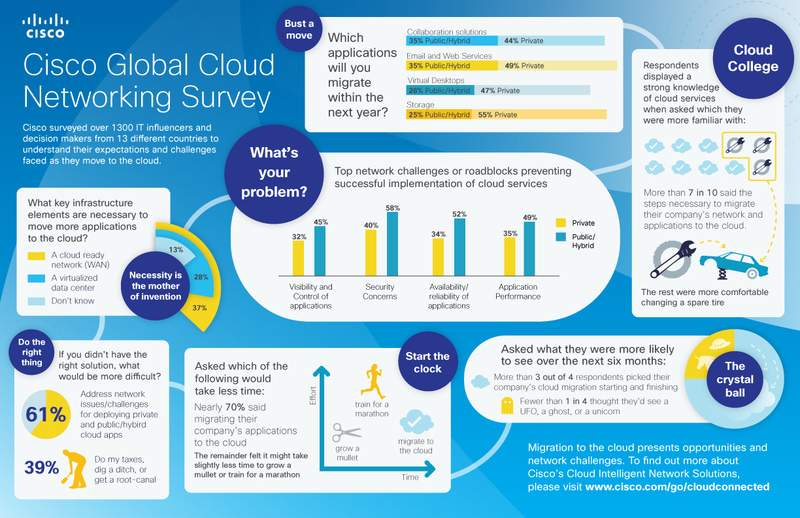 Many IT professionals find migrating corporate applications to the cloud a difficult, time-consuming and altogether painful task, according to the results of a new survey from Cisco (s csco). The 2012 Cisco Global Cloud Networking Survey queried more than 1,300 people on their feelings and experiences with moving to a cloud computing model, and the findings paint a somewhat confusing picture (perhaps due in part to the questions asked). While the majority of respondents expressed relative comfort with the state of their cloud migrations, some took rather extreme negative positions. But even IT personnel who don’t like it are stuck with the cloud: not going there would mean disobeying their bosses or, worse, not keeping up with the Joneses. One finding — not included in the infographic below — is that while 52 percent are moving to the cloud because of an imperative from above, 41 percent are following their industry peers. Hey, if everyone else is doing, what can go wrong? Another interesting response not included below: 76 percent of respondents believe their cloud applications will be breached, while a brave 24 percent “believe the odds are better for them to be struck by lightning than have their cloud applications breached by an unwanted third party.” Yet only 39 percent said they wouldn’t trust their personal information with the cloud provider they’re currently using. I agree to the fact that migration to the cloud is not an easy task. But what confuses me and makes me believe that the data is skewed is that 76% respondents believe that their applications will be breached but only 39% won’t trust their personal data with cloud. Slightly confused by the headline of this story – what are we trying to project is inconsistent with what survey depicts. Challenges in security need to be addressed with a comprehensive solution rather than ‘I also have cloud’ offering. Let us not boil down sentiment in an already down-ish IT market.